The Chineke! Foundation was established in 2015 to provide career opportunities to young Black and Minority Ethnic (BME) classical musicians in the UK and Europe. The Chineke! Ensemble will be performing in Chatham this February, with tickets free for all students and staff (£10 for public). 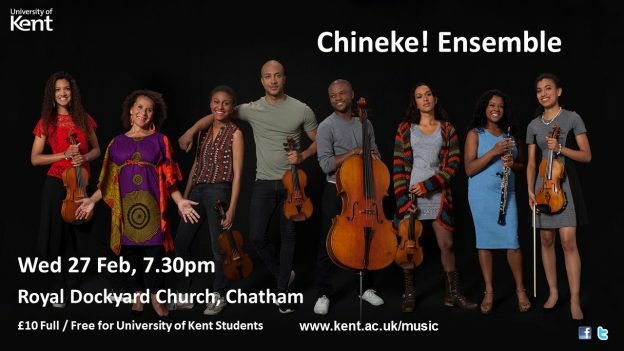 Chineke!’s motto is: ‘Championing change and celebrating diversity in classical music’. The Chineke! Ensemble is comprised of exceptional musicians from across the continent brought together multiple times per year. The event has been organised by University of Kent Arts&Culture, and tickets can be booked online. This entry was posted in Campus online, Medway Student, Student Guide on 23 January 2019 by Allie Burnett.